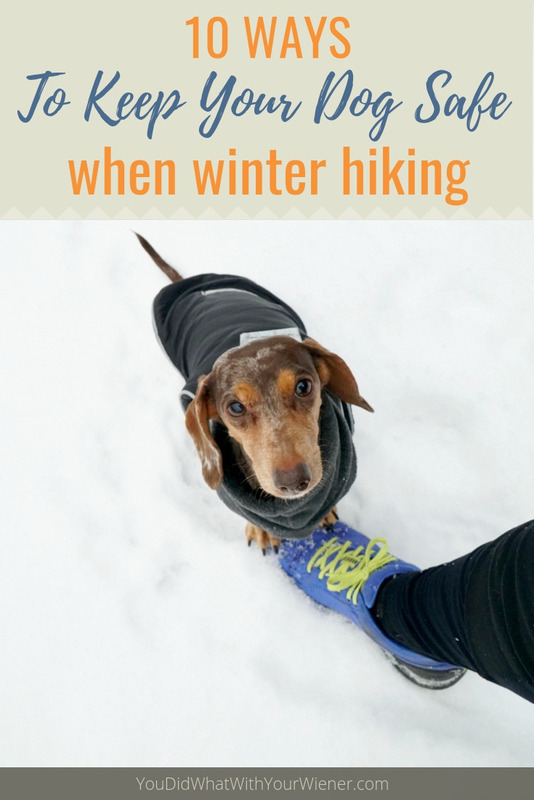 Hiking with your dog in winter is a great way to get exercise in the colder months. I love to hike in the winter with Gretel. As far as the views go, it’s my favorite time of year. The mountains look so much cooler with snow on them. Gretel loves it too because, while there are likely fewer smells in the snow, they’re more intense. Hiking in the winter is very different than hiking with your dog in the summer. There are more dangers and dangers specific to the season. However, if you and your dog are properly prepared and up-to-date on safety tips, it can be a lot of fun for both of you. To make sure your dog is ready to take on the challenge, here is the most important thing you should do. Before you head out on any hike – whether it be in the winter or summer – you need to make sure your dog is physically up to it. For example, young puppies shouldn’t go on long hikes until their growth plates are fully formed. Senior dogs may have sore joints or arthritis that is made worse in cold weather. Be aware of “weekend warrior” syndrome with any dog. We tend to be more sedentary in the winter so heading out once a week for a physically challenging hike can be too much for a dog. Make sure your dog is getting the right amount of exercise and is basically fit before taking it on a big hike. If you want to turn your dog into an athlete, consider further physical training using these conditioning exercises. If you can’t stick to regular exercise several times a week, consider going on shorter and easier hikes than you would in the summer. Enduring the cold, and wading through powdery snow, already makes a hike more challenging for a dog. Some dog breeds are naturally equipped for long hike in the cold weather. Most are not. Acclimate yourself and your dog to the cold and by beginning venturing out in the cold around home if you can. Monitor your dog’s condition – is the dog showing fatigue by panting hard, limping? When you stop to rest, how quickly does your dog recover? Are they shivering? Are the paws sore or chapped? If you are not sure, consult your vet again, and consider modifying your hiking plans to accommodate the dog’s abilities. Hiking in the snow is a lot harder than walking on pavement or hiking in the summer. Your dog will use extra energy to keep their core body temperature up. Walking in snow can take more effort, too. If it’s powder snow, it can be like walking in sand. Plan shorter hikes – at least at first – and understand that your dog may be ready to turn back before you expect. A good rule-of-thumb is to start with hikes one-third to one-half the distance of the ones you do in warmer, dryer weather. Over a period of at least a couple of weeks, gradually increase your distance and the difficulty of the terrain. Outfit yourself and your dog for the conditions and the terrain. You will likely carry a backpack. Does the dog need one, too? Consider how much time your hike will take and how much gear you will need to keep you both comfortable for that length of time. For example, you will need to carry enough water and food for both of you (water sources will likely be covered in snow or frozen). Don’t forget the dog bowl too. Depending on whether you are going to hike in very cold temperatures, through snow and ice, or around bodies of water, you may want to carry towels to get as much as the water off as you can to reduce the likelihood of icicles forming. You may want to carry an extra dog coat or sweater in case one gets soaked and, if your dog will be wearing boots, you may want to carry a spare in case one falls off. I highly recommend bringing an extra pair of dry socks for you (actually, I never hike without them no matter what season it is). Also, don’t leave home without a first aid kit and the 10 Essentials. Does your dog need winter boots to protect its paws from ice, snow, rocks or other harsh conditions? If your dog will use boots for the hike but is not accustomed to wearing them, you’ll need to get your dog used to wearing them before you go. Training your dog to comfortably wear dog boots can take weeks so be sure to start training for these well before you head out on your first winter hike. If you don’t think your dog needs boots, or you can find any to fit them (like in the case of small Dachshunds), protect their feet with a paw balm like Musher’s Secret instead. Think about your dog’s coat type/length and the weather you may encounter during the hike. If your dog has a heavy coat naturally suited to cold, windy, wet, winter weather they probably don’t need a sweater or other clothing. However, if your dog is a short-haired or smaller breed, your dog may need a sweater or waterproof coat to keep warm on the hike. Again, you will need to condition the dog to wear anything that it is not used to. Be sure to start getting your dog used to wearing and walking in a jacket before you head out for your first winter hike. Always supervise your dog when it is wearing clothes. You’ll need to be ready to step in if the dog gets wet or tangled up in the clothing. You’ll also need to check that your dog’s jacket or harness is not chafing their neck, sides, legs or armpits. Be sure to tell someone where you are going and stick to your planned route. In the winter, trails typically look very different than they do in the summer. Oftentimes, they take a different route to the destination completely. Make sure you are familiar with the winter route and don’t wander too far from it. General winter hiking hazards include getting stuck in an unexpected snow storm, avalanches, slipping on ice, falling through snow bridges or ice or falling in a deadly tree well. Check the weather and avalanche conditions before you go. Use good judgment if you encounter trail hazards such as ice or deep snow pockets or drifts. And don’t let your dog wander too close to the base of trees or they could get trapped in a hole or tree well. Watch your dog for signs of hypothermia, or frostbite, and know what to do about it. One of the other biggest winter hiking dangers for your dog is dehydration. Yes, I know it sounds silly because it’s not hot out but it’s a real risk. Your dog is working hard in the winter though and “perspiring” water vapor even if you can’t see it. There are fewer daylight hours in winter. Unless you are adequately prepared to camp overnight, you need to time your hike so it doesn’t get dark before you get back to your transportation home (and remember, it gets darker in the woods before it gets darker in an urban environment). If you get lost or for some reason are late getting back, you may have to walk along a road in the dark. You will be easier to spot if you are wearing reflective clothing or your dog is wearing a reflective or lighted collar. Following these safety tips will help keep your dog healthy, and both of you happy, when hiking and snowshoeing in the winter. Note: this article was originally provided to me by the folks at Pet Wellness Advisor but I’ve added my own edits and recommendations. 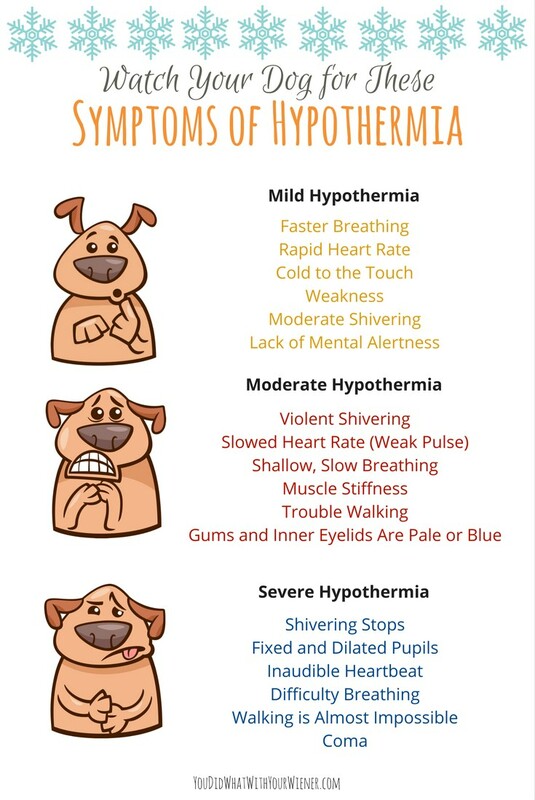 Great advice – I’ve never seen the symptoms of hypothermia for dogs, thanks for sharing! Sure. It can happen pretty easily. I know dogs that have got it from swimming in a cold river during the winter. Re point #8: Our border collie Habi got trapped last winter on a snowshoe hike. She investigated an open space under some overhanging willow branches, and as she pushed in further they closed behind her so she couldn’t back out. This was about forty feet off-trail down a slope in about five feet of snow. Our BCs have often ranged out of sight on our hikes, but check in with us frequently. We would have noticed her missing fairly soon, but might not have located her had we not been watching her. It was easy to liberate her once I got down to the willows, but there was no way she could have gotten out by herself. Scary! Thinking back on it, we should teach Obi “Go find Habi” so he can lead us to her if she ever gets into a jam again. Glad you saw where she went. If the branches had obscured her, or she had got buried in snow, the situation could have turned bad. So glad it didn’t though! Oke, this is about Dogs, but liked your advice to take an extra pair of socks the most 😉 This winter my dachshund and I will go hiking in the snow for the second time! I learned a lot last winter so I definitely will be better prepared! My dog hate the cold weather. I have a self heating mat ,warm blanket for him and of course he has a jacket on. Thank you for the informative post! 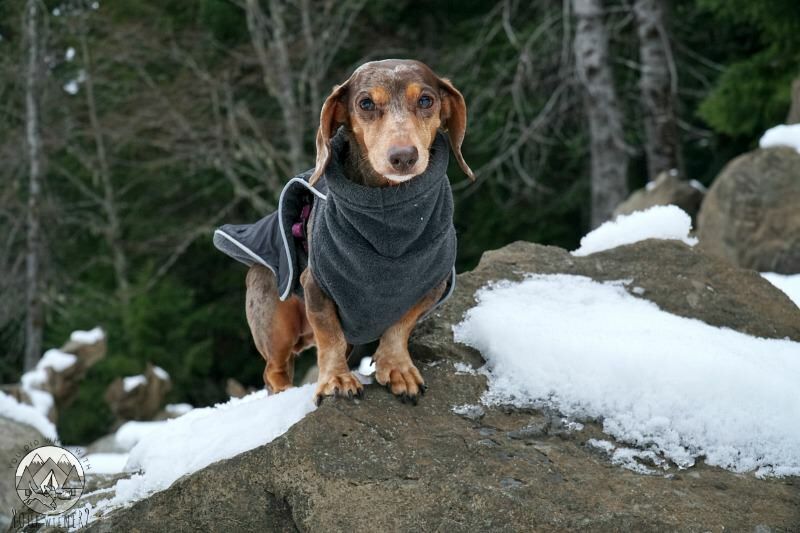 I wish that my dachshund Rocket enjoyed hiking in the winter but he doesn’t. It’s completely my fault- I never really acclimated him to winter hiking and always went without him. Had I started him slowly with it, he would probably be fine. I began taking him on hikes very young and now he is still at almost 10 and excellent hiking buddy but as soon as the snow falls, he prefers the indoors. I sometimes wonder if I could start trying winter hiking very slowly for short distances or if he is set in his ways by now 🙂 It’s hard because he tends to get bored in the winter and exercise can be challenging. Are there any snow-free hikes where you are? Maybe get him a super warm jacket and start him out with “cold but no snow”? Chester was still going pretty good at that age but he WAS starting to get more set in his ways… If “more” is possible for a Dachshund. Ha, ha. This isn’t exactly related to this post in general, but I wasn’t sure where to put it! I found your blog while searching for anyone who had the same experiences I did with my d)og. I have a 2 year old border collie who was ‘skipping’ behind, when transition from a trot to a canter/run. That was the only symptom I could find, and your blog post on Gretel was the only thing that remotely resembled her problem! Of course I was disheartened to hear that Gretel had IVDD, but thought, surely not for my pup. By February she looked the same as the beginning, so I took her to a neurologist and got the MRI and CT done. L7-S1 disk herniation. It was mild, and they recommended medical management with gabapentin. But, everything I read about working dogs suggests that medical management simply does not work for these kinds of active dogs! I wanted to know your experience with medical management, and how active you’ve kept Gretel after the diagnosis. I’m torn as to what to do with my girl, and hearing a success story from someone else may help me hold back from pushing for a surgery she may not need. Hi. I’m sorry to hear that your pup is having disk issues. I know that Border Collies can have IVDD but it’s much less common than with Dachshunds. I’m assuming you found my master page that links to all of my IVDD articles? If not, you can check it out here. https://youdidwhatwithyourweiner.com/inervertebral-disk-disease-ivdd-resources/ Your question is not answered in one blog post alone but there are several related to her rehab. In a nutshell though: Gretel was on strict crate rest for a week or so then our rehab vet said we could start treatment. I started with cold laser and hydrotherapy where she walked on an underwater treadmill. We started with 5 minutes of walking under water and worked our way up. I believe we did sessions about once a week at first. When she wasn’t in rehab, she was on strict crate rest at home. After the first couple of weeks, they also started her on gentle doggy gym exercises (on a balance ball, lateral walking, etc). There is an article about those exercises on the page I linked to above. About the same time, I was given the go ahead to start walking her 5 minutes a day. We slowly worked our way up to longer distances. I tried acupuncture treatments for her too. We did rehab and crate rest for 10 weeks (she probably was ok at 8 but I wanted to be extra sure) then rehab for a couple of months after. Now she’s hiking again like the did before she has the back issue. I choose to live an active life with her. I know it could happen again, and even worse, but I believe life itself is a little risky and you need to do what you enjoy. However, hiking is not as strenuous on a spine as agility is because of the sprinting and fast turning. If she heals up, continuing with it will be for you to decide. I have a friend whose agility champion dog was diagnosed with IVDD and she chose to end his career to keep him safe. It’s not all doom and gloom though. Her pup will still live an active live but actually competing in agility is out. I know it hurts to think about your plans with your healthy, active dog potentially being taken away. There really is hope though. The crate rest is super important. You can do rehab stuff on your own at home. Gretel’s not the only dog I know that recovered and went on to live an active life. And some of those dogs were at a more severe stage than Gretel. Good luck to you and your pup. I did not find the master link, but I have read some of them in my quest for information! If my pup could just get back to hiking, I would be thrilled 🙂 It’s just ‘doom and gloom’ all over the internet, but I am much like you–I want her to live quality years, not just a lot of them. She really is miserable inside my house, despite everything we’ve done to keep her busy thus far. I am actually a vet student at the University of Tennessee (I saw your post about my school! ), so getting her to rehab is the goal, and I already have some of the fitpaw equipment at home. I can’t tell you how much I appreciate your insight; the surgeons can only tell me so much, when most of their patients consider ‘going outside to go to the bathroom on their own’ a success surgery success. (Don’t get me wrong–sometimes that is a wonderful success! But it is just not relevant to my situation). Also, ignore the typos… Today was a long day! I love this! I’m always super hesistant to take my dogs out in the snow for too long. I always go with “if it’s not comfortable for me, then it can’t be comfortable for them”. But it’s great to read up on ways to make the trip more enjoyable for my dogs, because sometimes I wonder if they’re even colder than me. We don’t typically do a lot of hiking in the winter time, but I’m getting back in touch with the photographer in me and would love to be able to take my guys out for a photoshoot on a snowy hike next season! 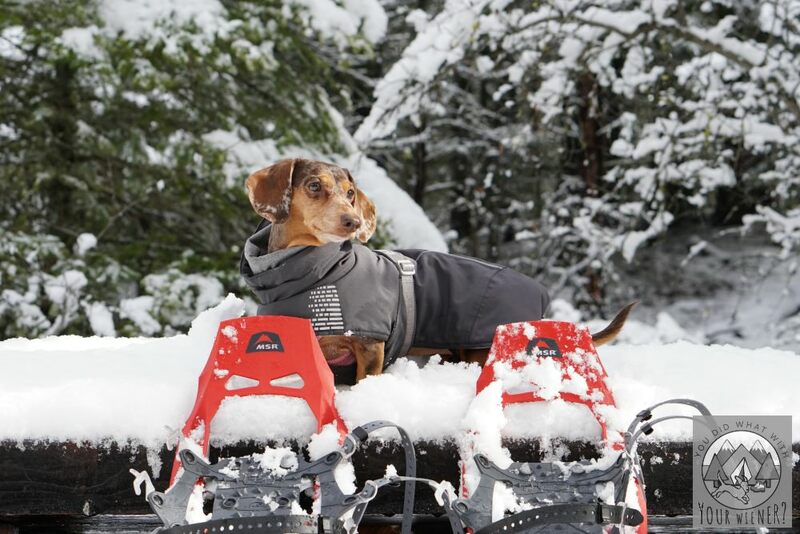 Having good gear means a lot in winter conditions, not just for you but for your pet too. You should consider applying some dog cosmetics on their paws that’ll protect their gentle skin from the ice and cold, and help repair it after your walk. After you return to the warm comfort of your home remember to wash of any remaining snow on their fur and paws with warm water. That especially applies if you were having a stroll in the street which are, during the winter, often coated with chemicals, salt and sand used for defrosting. Great tip. This article is specifically addressing hiking so salts are not a concern (that’s something people do in developed areas). However, I do put Musher’s Secret paw balm on Gretel’s feet to help to protect them from abrasion and snow sticking. came across your blog. It is amazing. Keep it up! Great advice for Hypothermia. All I did was to just buy ice boots for my dog. Now, I don’t think that is adequate. Great tip. This article is specifically addressing hiking so salts are not a concern (that’s something people do in developed areas). Great tips, gotta try this, but need to train my dog first since I’m still new of having a pet or a family in my part, cause you know I’m kind of afraid he might wander around and might get lost so maybe a tracker or an accessory which can locate him is going to be very helpful.